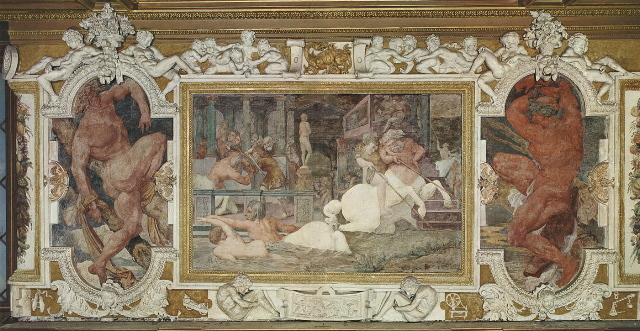 Frescoes, lost oil paintings on panel, and partially gilt sculpture and framing elements in stucco. The gallery, the plan of which is not absolutely rectangular, measures, within the limits of the wood paneling but not taking into account the depth of the window embrasures: 60.84 m. along the north side and 60.53 m. along the south side by 5.78 m. at the west end and 5.70 m at the east end. The east end of the gallery is not square. The depth of the embrasures is 0.36–0.40 m. The height of the gallery is 6.15 m. The partially gilt wood paneling is around 2.35 m. high; the height of the decorated wall areas is around 2.8 m. Each decorated wall area of the north and south sides (except the divided VII North) is 6 m. wide or slightly more (Fig.Collette Plan).1 The dimensions of the large central paintings (from “Galerie,” RdA, 1972, 26) are given in the relevant sections below. 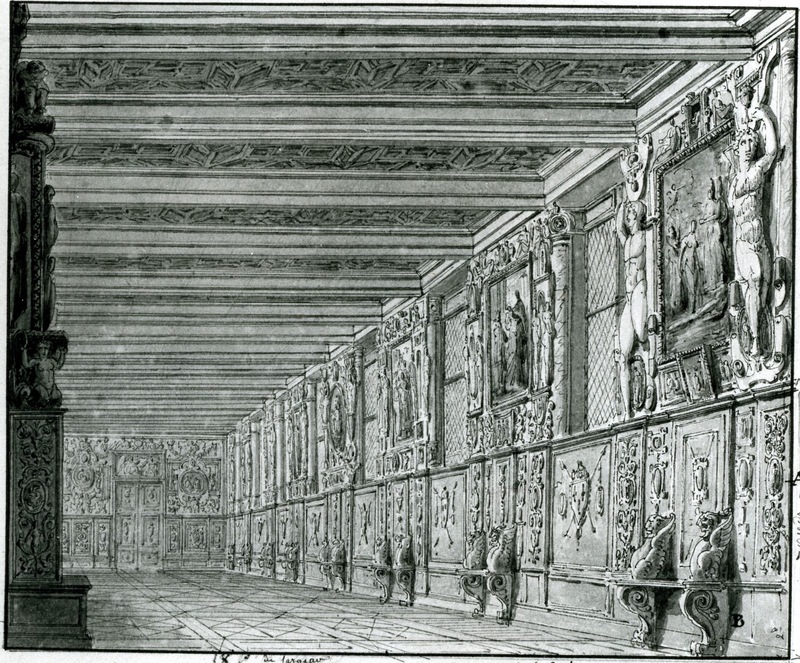 The gallery is composed of fifteen bays, seven wide ones formed by the walls on the long north and south sides, alternating with eight narrower ones formed by the full-length casement windows on the south side and four false full-length casement windows and four doors imitating such windows on the north side.2 There is a large door rising well above the upper level of the wood paneling in the center of the West Wall (Fig.P.22, WestWall, a). A similarly large door is also situated at the left end of the East Wall (Fig.d’Orbay drawing a), matched by a false door at the right.3 The coffered ceiling (Fig.P.22Ceiling; Fig.Percier drawing 2, Ceiling) is set upon regularly spaced crossbeams, two above each pair of facing wails between the windows (and false windows). 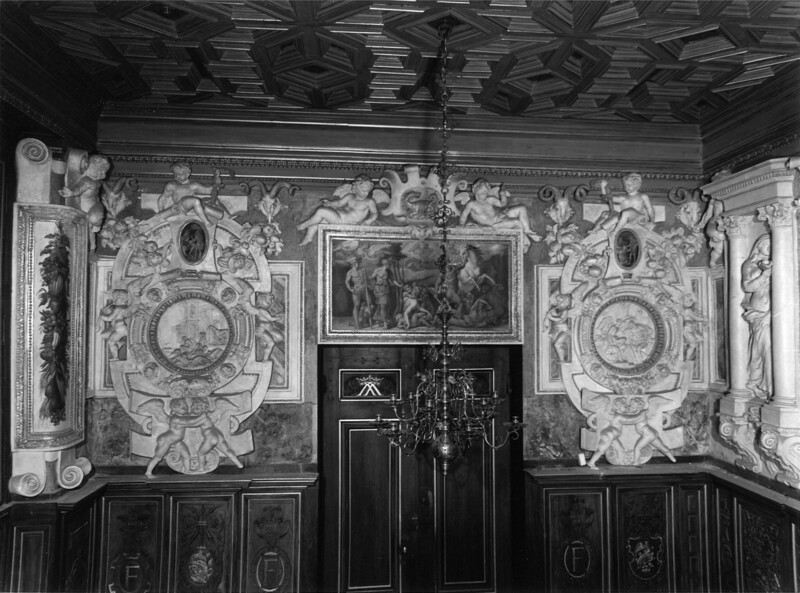 Rosso’s painted and stucco decoration is placed on the walls above the wood paneling and beneath the level of the cross beams, some of the stuccoes extending above the level of the wall into the area of the nineteenth century wood frieze set between the beams and the wall (see below). 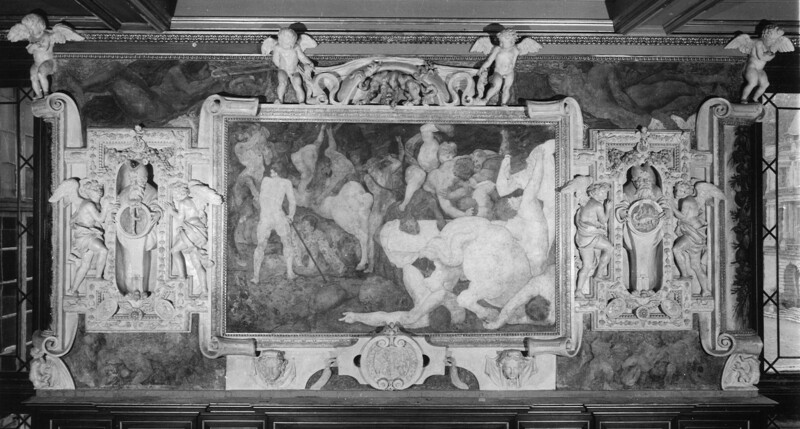 Numbering the wall bays from the east end and identifying each by the subject of its principal picture they are: I North, Venus and Minerva, followed by a small section of wall at the east end of the north wall (Fig.P.22, I N a); I South, The Combat of Centaurs and Lapiths, preceded by a small section of wall at the east end of the south wall (Fig.P.22, I S a); II North, The Education of Achilles (Fig.P.22, II N a); II South, The Loss of Perpetual Youth (Fig.P.22, II S a); III North, The Revenge of Nauplius (Fig.P.22, III N a); III South, The Death of Adonis (Fig.P.22, III S a); IV North, The Nymph of Fontainebleau, an eighteenth and nineteenth century replacement of the decoration of the entrance to the destroyed North Cabinet; IV South, Danaë, by Primaticcio in a frame by Rosso designed for his Nymph of Fontainebleau and replacing a planned but never finished or decorated South Cabinet and its entrance; V North, The Twins of Catania (Fig.P.22, V N a); V South, Cleobis and Biton (Fig.P.22, V S a); VI North, The Royal Elephant (Fig.P.22, VI N a); VI South, The Unity of the State (Fig.P.22, VI S a); VII North, Scene of Sacrifice, the decoration of this wall is interrupted by a door, on the west side of which the decoration continues followed by a small section of wall at the west end of the north side (Fig.P.22, VII N a); VII South, The Enlightenment of Francis I, followed by a small section of wall at the west end of the south side(Fig.P.22, VII S a). 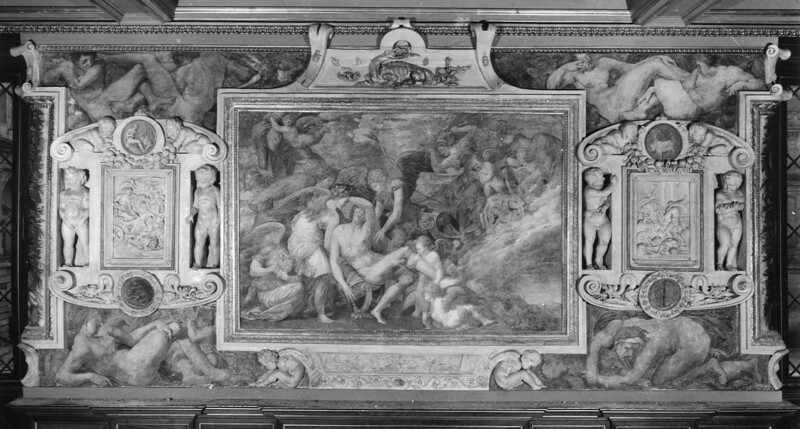 In addition there are the West Wall (Fig.P.22, WestWall, a), originally with an oval panel painting of Venus and Cupid (and Psyche?) 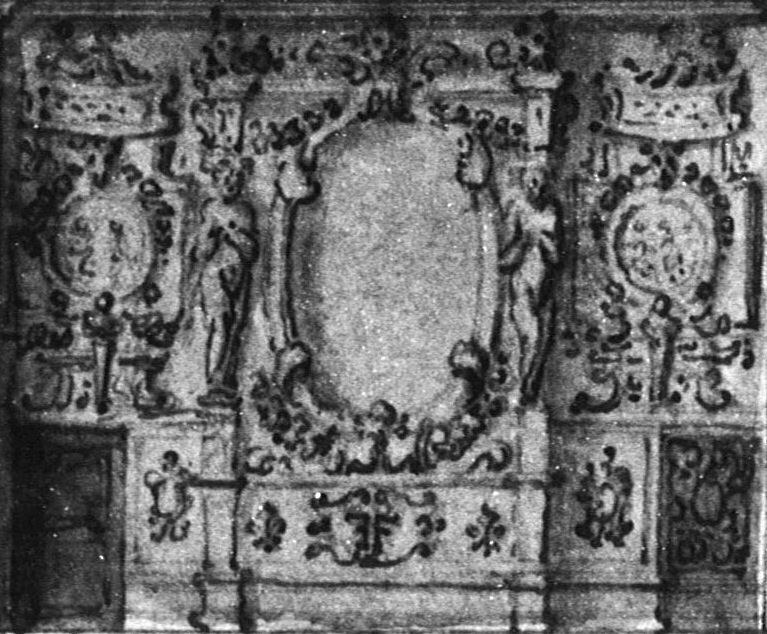 but now of the original scheme only the flanking decoration remains, and the East Wall, originally with an oval panel painting of Bacchus, Venus and Cupid4 but now entirely lost and replaced with a largely eighteenth century scheme of woodwork and sculpture. The principal frescoed pictures in frames on the north and south walls are surrounded by stucco and frescoed figures, scenes and ornament. 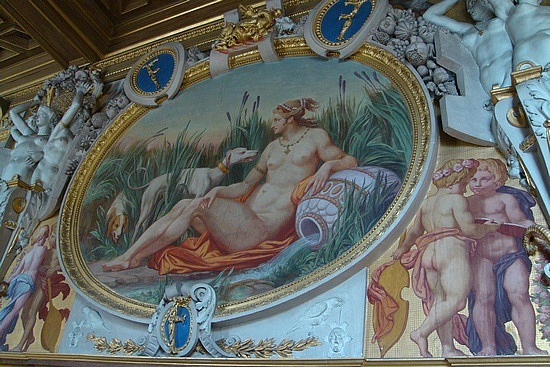 On the end walls the principal panel pictures were in oil, flanked by frescoed and stucco decoration. 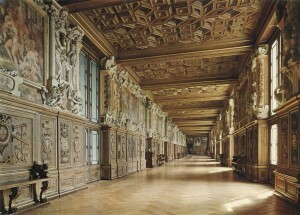 The gallery was entirely restored between 1960 and 1965 during which time its structure and decorations were, to the extent that was possible, returned to their original state.5 Certain earlier modifications could not be removed, or removed entirely, and certain parts of the gallery had earlier been irretrievably lost. The ceiling crossbeams originally rested directly upon the walls and not as they do now upon continuously joined lateral beams 0.21 m. high (although the crossbeams are not now as high as they were when the ceiling was raised 0.82 m. in the nineteenth century).6 On the north side all the windows were blocked in the late eighteenth century and light enters now only from the eight south windows. However, on the north side there were only seven windows, not counting the window in the destroyed North Cabinet. An eighth one at the west end would seem to have been false.7 In the center of the north wall was the entrance to a small square cabinet; both the entrance, which probably rose above the level of the wood paneling, and the cabinet were eliminated late in the eighteenth century when the entrance was walled-up and its surrounding decoration destroyed; this wall area was then decorated with a copy of the stuccoes of the Danaë wall across from it which was used in the nineteenth century to frame a painting of the Nymph of Fontainebleau (Fig.P.22, IV N, Present Decoration) derived from the print after Rosso’s design by Milan and Boyvin (E.103).8 The casement windows did not originally extend from ceiling to floor. 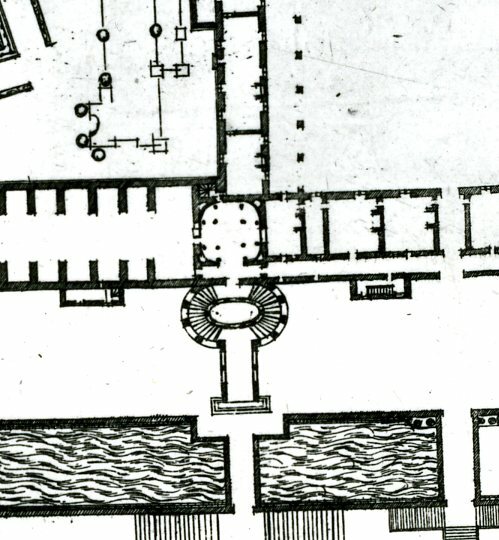 Their bottom level was somewhat higher as can be seen in the small exterior view of the gallery under the Venus and Minerva (Fig.P.22, I N h) and in d’Orbay’s cross-section of the east end of the gallery (Fig.d’Orbay drawing a). The bottoms of the windows seem to have been at about two-thirds the height of the wood paneling up to the level of the wood moulding under the oval pictures at the ends of the gallery and hence sufficiently low to allow a view outside.9 Toward the end of the seventeenth century a door was let into the west end of the north wall breaking into the decoration of the Scene of Sacrifice; the left stucco panel was remade with half of it set to the left of the door, which now resembles the other casement windows in the gallery. There was originally a small door here apparently set just slightly farther to the west within the wood paneling that led to a staircase that descended to the level of the abbey. 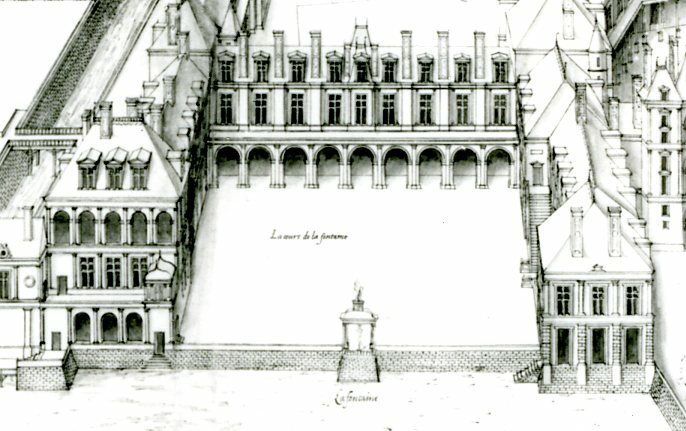 This staircase is contained in the specifications of 1528 and appears in Du Cerceau’s printed plan (Fig.Du Cerceau Engraving, Plan; Fig.Du Cerceau Engraving, detail) and was mentioned by Dan, 1642, 98, as connected to the fifth room of the Apartement des Bains.10 At the far east end of the north wall another door, replacing a (false) window, was let into the wall in the nineteenth century and this, too, now resembles the other real and matching false casement windows.11 The large center door of the west wall was built before the middle of the seventeenth century.12 At this time the original center decoration and all the wood paneling of this wall were destroyed and Rosso’s oval oil painting that was the centerpiece of this wall disappeared. The stucco decoration above the door is possibly of the seventeenth century, or later. 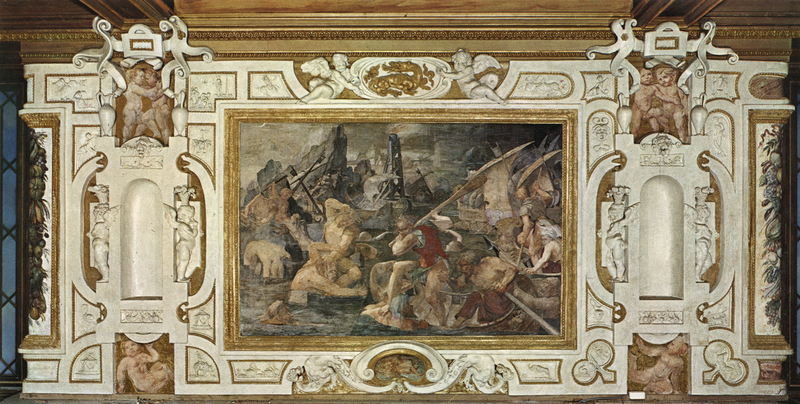 The present rectangular painting is of the nineteenth century and copies a composition of the Contest of Athena and Poseidon by Rosso known from prints by Fantuzzi (E.78) and Boyvin (E.13). Originally there may have been two false doors set within the paneling of this wall to match the arrangement at the east end. The East Wall was entirely remade in the eighteenth century at which time its alignment was slightly altered to square it with the north and south sides thereby damaging the decorations at the ends of those walls. Rosso’s oval oil panel painting in the center of the east wall disappeared at this time. The design of the coffered ceiling is original but much of the wood has been replaced and the original coloring of some of its detail is not known. 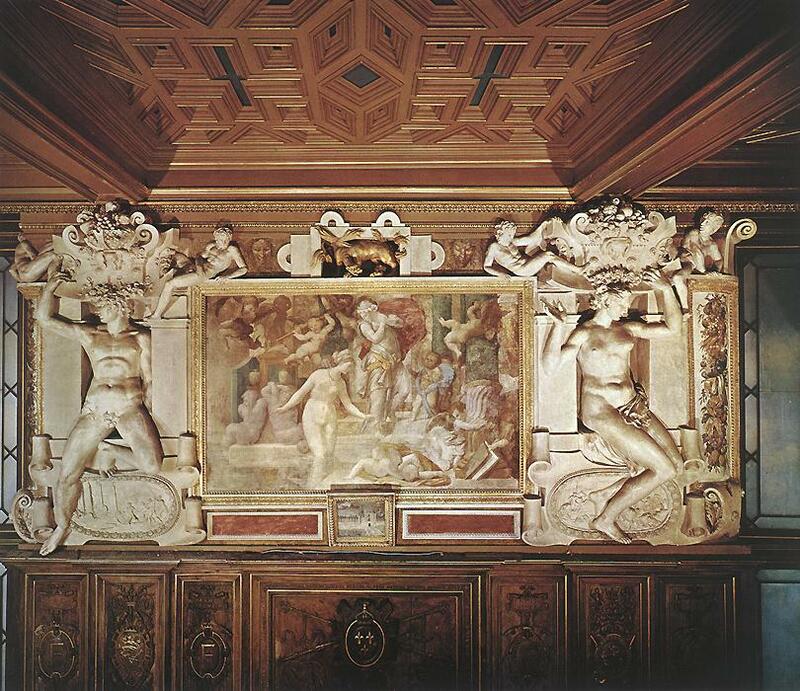 The wood paneling has been much restored and remade, and there was originally a bench in the center of each wall of the north and south sides, except, of course, at the entrance to the North Cabinet, and possibly under the Danaë across from it. 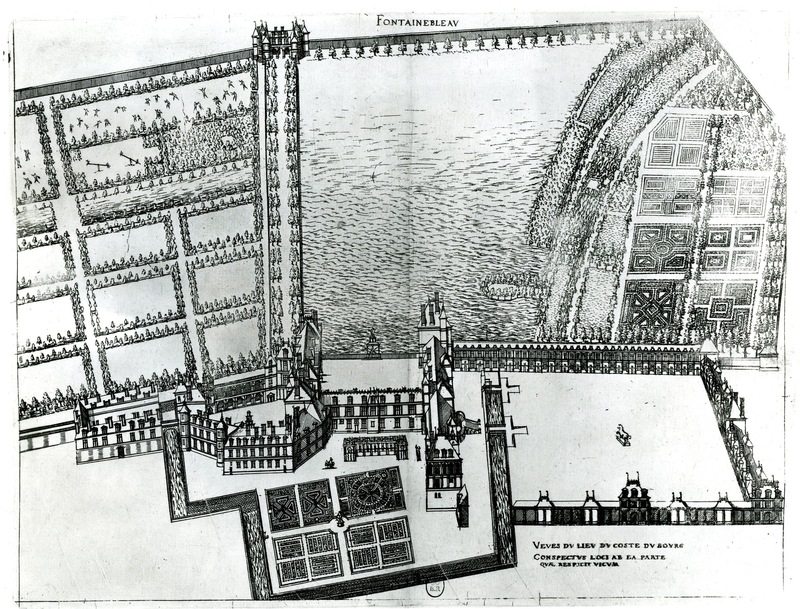 d’Orbay’s drawing of 1628 does not show a bench against the East Wall and one may assume there was not one originally against the West Wall. The floor is not the original one which, it would seem, was laid in a pattern of squares and lozenges. (On these parts of the gallery, see below). 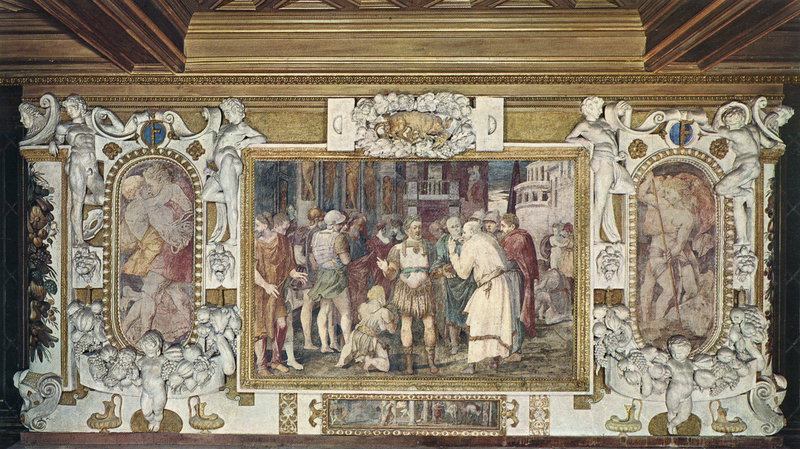 The frescoes have suffered and in many places to such an extent that they no longer reveal the force of their original effect, especially in relation to the generally better preserved stuccoes. The garland panels at the outer edge of each wall were repainted in the nineteenth century and this repainting has not been removed. However, the stuccoes, the draperies of which seem originally to have been partially gilt, have not been significantly altered except where the raising of the crossbeams damaged their composition; the insertion of the lateral beams would also have caused considerable breakage that required restoration and some modification of the original designs.13 The most serious changes are those made to the male and female satyrs that flank the Enlightenment of Francis I (Fig.P.22, VII S a) which originally held up the beams with their large hands and supported them on their heads; they now hold up large broad urns. 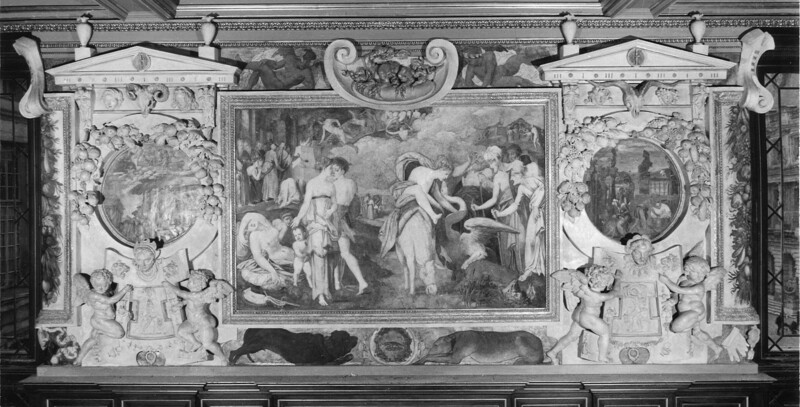 As mentioned above, the stucco panel to the left of the Scene of Sacrifice was divided and remade in the seventeenth century. Of the various modifications the most serious to affect the original appearance of the gallery are the raising of the beams and the ceiling, the elimination of all illumination from the north side, the closing of the large entrance to the North Cabinet, the remaking of the wall that contained this entrance and the loss of its original decoration, the destruction of the North Cabinet, the total change of the East Wall and the addition to it of two large doors at its far left and right (the latter one false), and the introduction of a large door into the center of the West Wall. 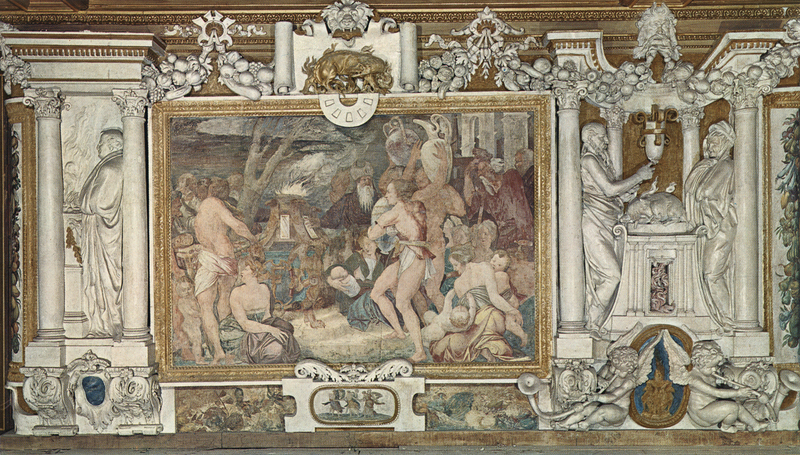 The deterioration of the frescoes has reduced their pictorial strength so that the more well preserved white stuccoes now tend to dominate the decoration. Major changes to the East Wall and the West Wall also resulted in the loss of two upright oval oil paintings by Rosso. The large entrances at the east and west ends suggest, more than was the case in the sixteenth century, a passageway leading from one place to another rather than a space in which to be enclosed14 and to walk to and fro, and in which to sit down on one of the benches that were under the pictures of the north and south sides. 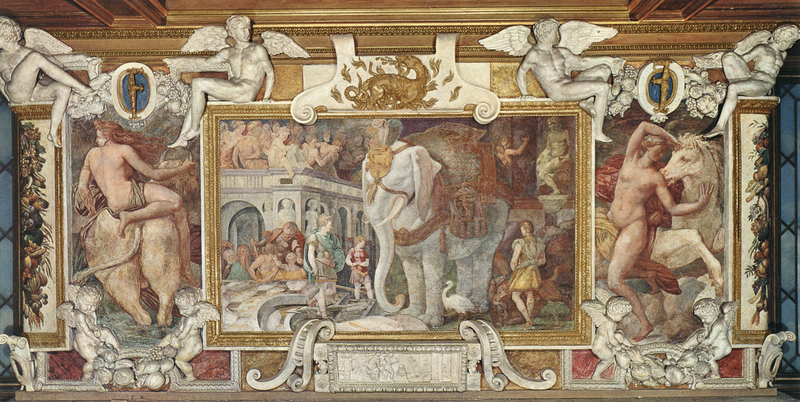 Nevertheless, since its recent restoration, the gallery exhibits much of its original state and the impression it makes conveys much of Rosso’s intentions. 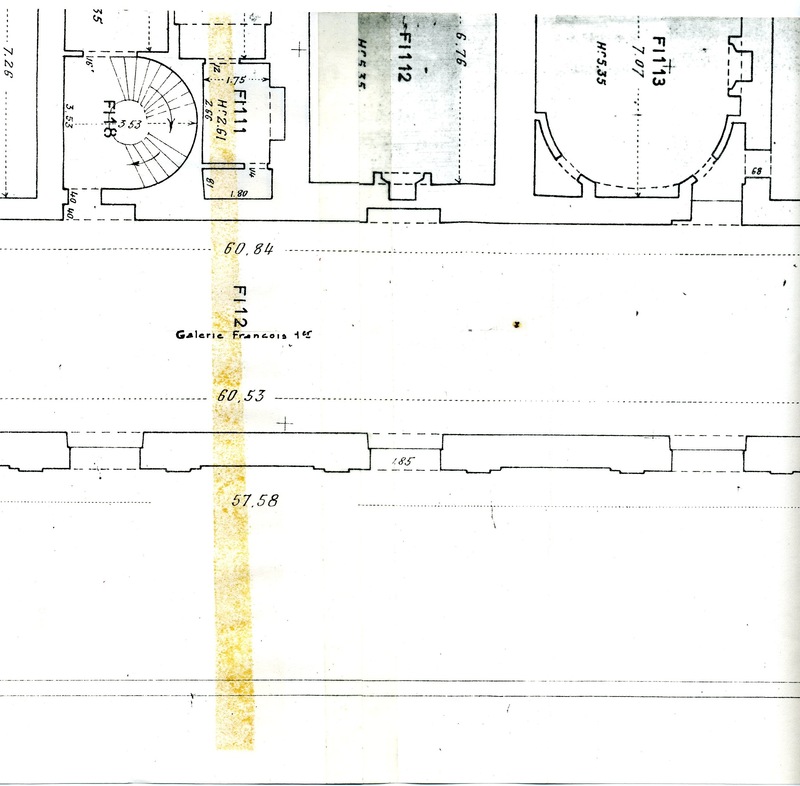 1 The dimensions of the plan and the total height are taken from the plan of B. Collette, architecte en chef, a copy of which was kindly sent to me by M. Jean-Pierre Samoyault, Conservateur en chef of the château (Fig.Collette Plan). 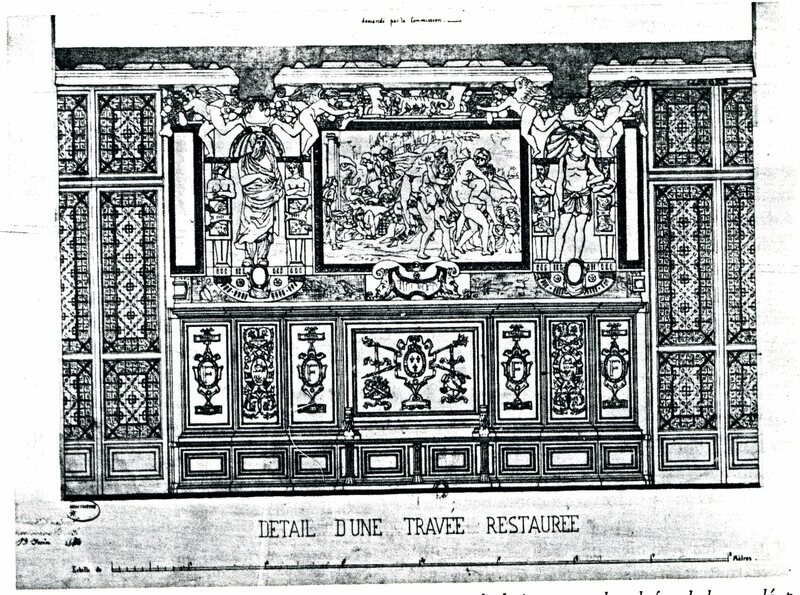 The heights of the wood paneling and of the decorated wall areas are calculated from Blouet’s scaled drawing of 1849 of V North (Lossky, 1974, 46, Fig. 8; Fig.Blouet 1849). The original total height of the gallery was 0.21 m. less, or 5.94 m. (see Lossky, 1974, 48). 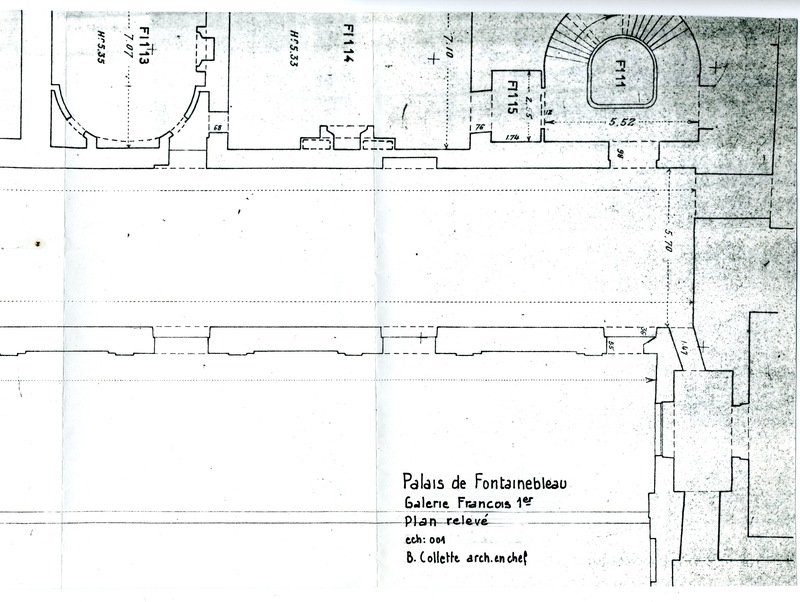 The plan in “Galerie,” RdA, 1972, 26, gives the dimensions as 64 m. by 6 m., with the height of the paneling stated as 2.25 m. McAllister Johnson, 1984, 127, gave the same measurements; he wrongly gave the dimensions of the central frescoes as those of the walls. 2 These doors are to the right of I North, to the right of III North, to the left of V North, and breaking into the left end of VII North. 3 There are two small doors set within the wood paneling leading to rooms beyond at VI North and at the east end of the south wall. 5 This restoration and the earlier changes that were made in the gallery are extensively documented and considered by Pressouyre in “Galerie,” RdA, 1972, 13–45, and by Binenbaum and Pressouyre in the same publication, 45–96; see also the comments on the restorations of Van Lao, Alaux, Couder and others in Reiset, 1859, 198–199, n. 1, 271, 272, 274; Kusenberg, 1931, 59–61; Barocchi, 1950, 113–116; Lossky, 1970; Lossky, “Cinq dessins,” 1970; Lossky, “Dessins,” 1971; Lossky, 1974; and Béguin, 1989, 829–831. 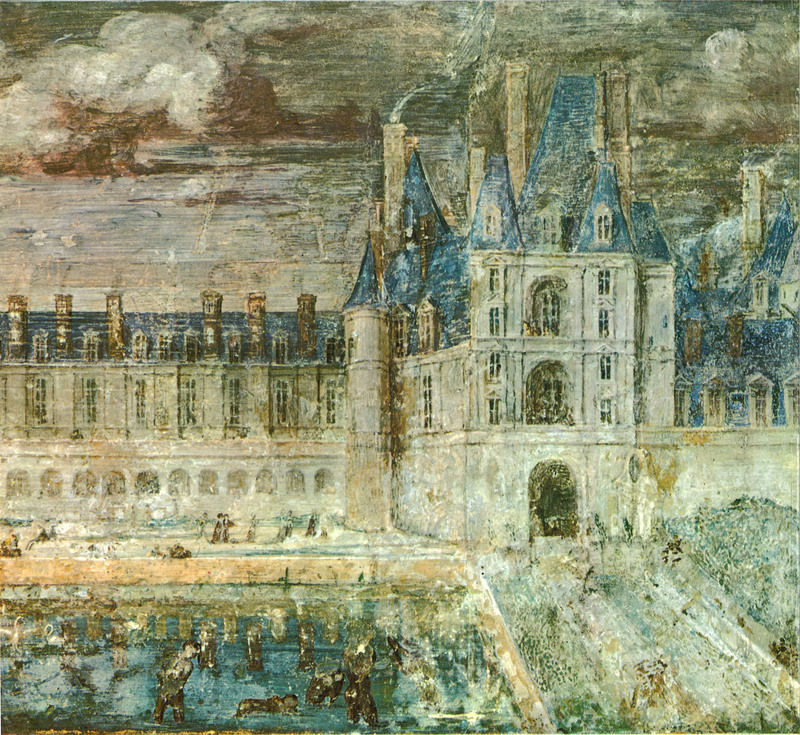 Adhémar, 1955, 110, mentioned that Antoine Caron restored paintings in the gallery in 1560. Bottineau, 1962, 24, n. 36, mentioned the restoration of the paintings in 1731 under the direction of Jean-Baptiste Van Loo in which Chardin participated, as had been pointed out by G. Wildenstein in 1959. On Delacroix’s criticism of the nineteenth century restoration of the gallery, see Vanaise, 1973, 187. 6 Lossky, 1970, 204, 207, said that the ceiling is now 21 cm. higher than it originally was when the beams rested directly on the walls. The two drawings by Viollet-le-Duc of 1834 that Lossky discussed give slightly contradictory information on the original placement of the crossbeams. 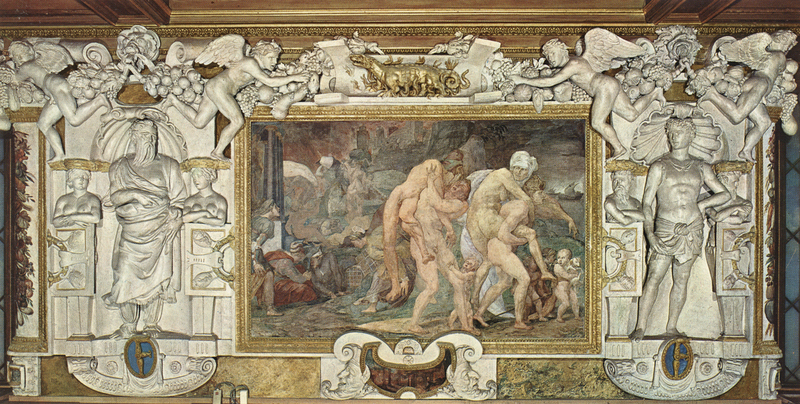 The drawing of the decoration to the right of the Death of Adonis (204, Fig. 1; Fig.Viollet-le-Duc drawing 2) shows the coffering of the beam below the upper level of the wall. The other drawing of the decoration to the right of the Revenge of Nauplius (206, Fig. 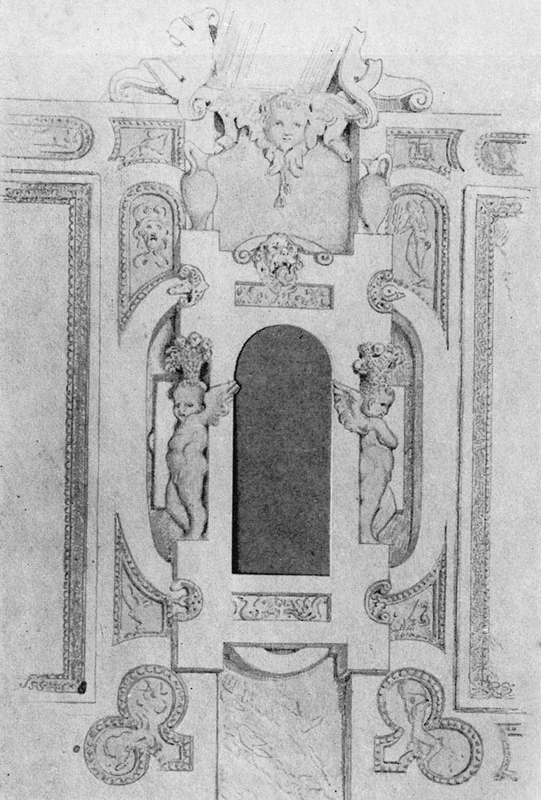 5; Fig.Viollet-le-Duc drawing 1) shows the coffering above the wall. 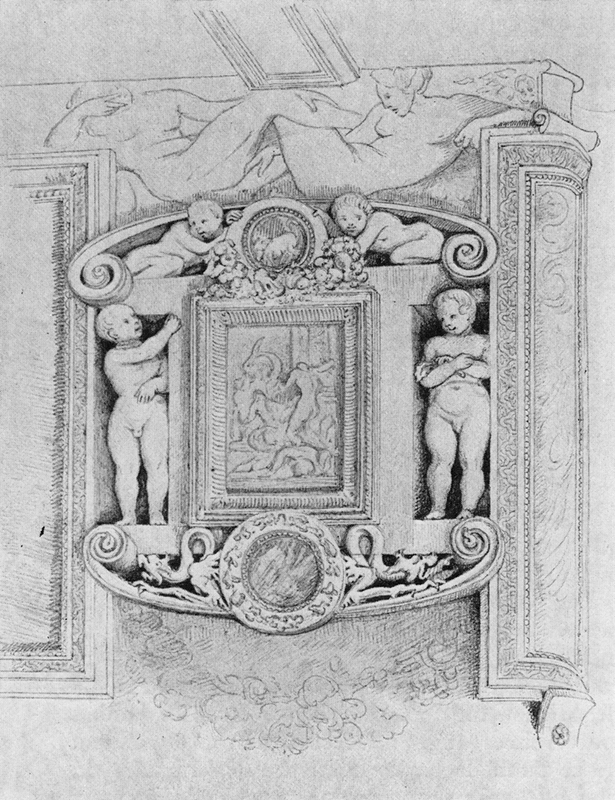 But the proportions of the upper part of the decoration in this drawing are too short, which places the beam higher than it was in relation to the upper edge of the wall. 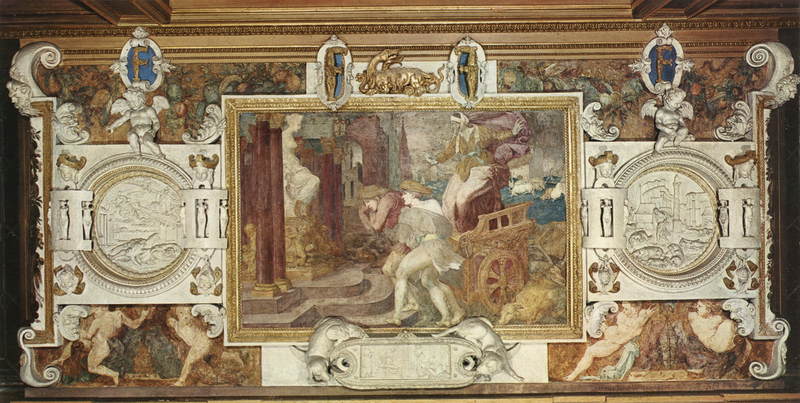 The tapestries in Vienna (see below) show the crossbeams resting directly on the walls. But the beams shown there have no coffering. It should be noted that the tapestries were not made from what was actually executed in the gallery. What seems originally to have been the situation in the gallery is that the beams themselves as structural elements rested directly on the walls and that the coffering attached to them extended below the upper level of the walls. On the original height of the ceiling, see also n. 1. 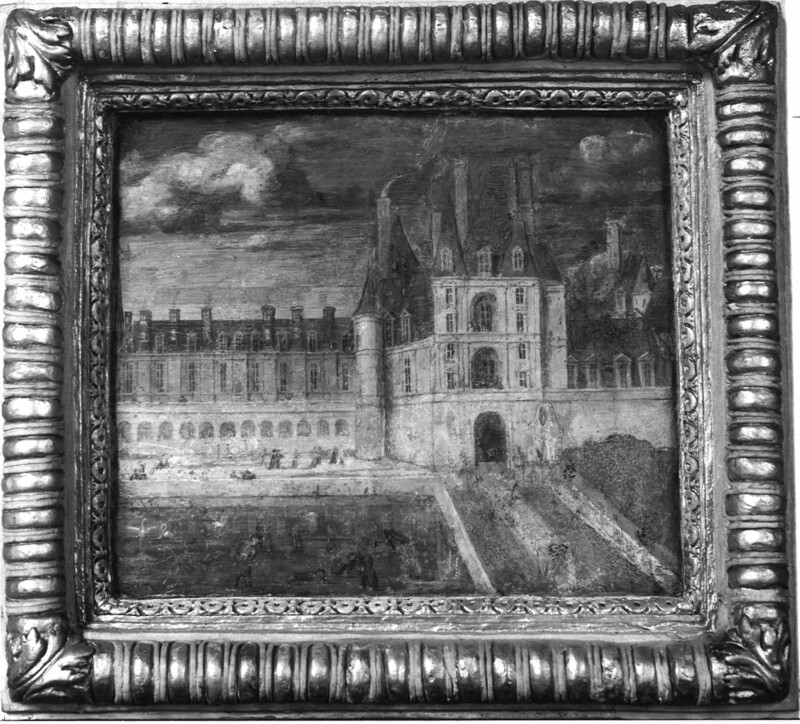 7 The small fresco (Fig.P.22, I N g) beneath the Venus and Minerva in the gallery and Du Cerceau’s views from the south (Fig.Du Cerceau View BM Drawing, Gallery; Fig.Du Cerceau Print, Gallery) all show eight real windows in the south facade and a false ninth window in the very center (on which see below). Du Cerceau’s view from the north (Fig.Du Cerceau North View; Fig.Du Cerceau North detail) shows six windows and a seventh in the center that actually belonged to the North Cabinet. But another window at the east end of the north side is probably hidden by the building in front of it but without a dormer above it. 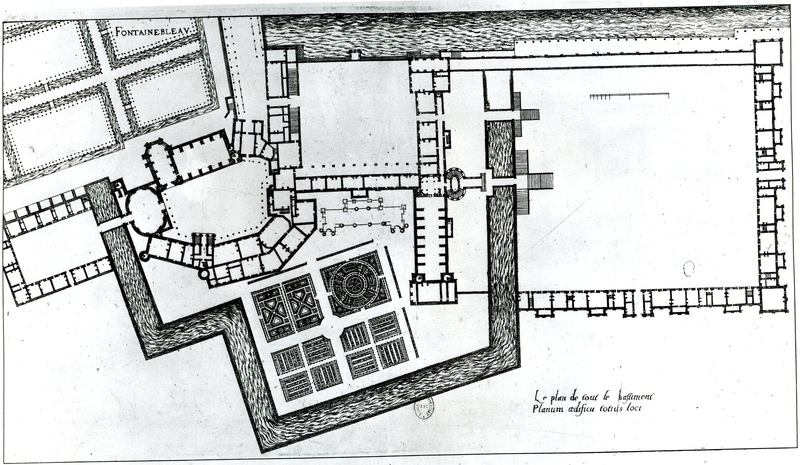 A window here appears in d’Orbay’s cross-section of 1682 (Fig.d’Orbay drawing b; see below). It is only an assumption that on the inside there was a false window at the west end of the north wall, but it is likely that this was the case given the symmetrical aspect of the composition of the gallery and that a false window was used elsewhere in the gallery, on the exterior of the south side. The lack of a window at the west end of the north wall may go back to the original plan of the gallery that placed a cabinet here from which a door leading to a descending staircase was prescribed in the specifications of 1528 (see below). 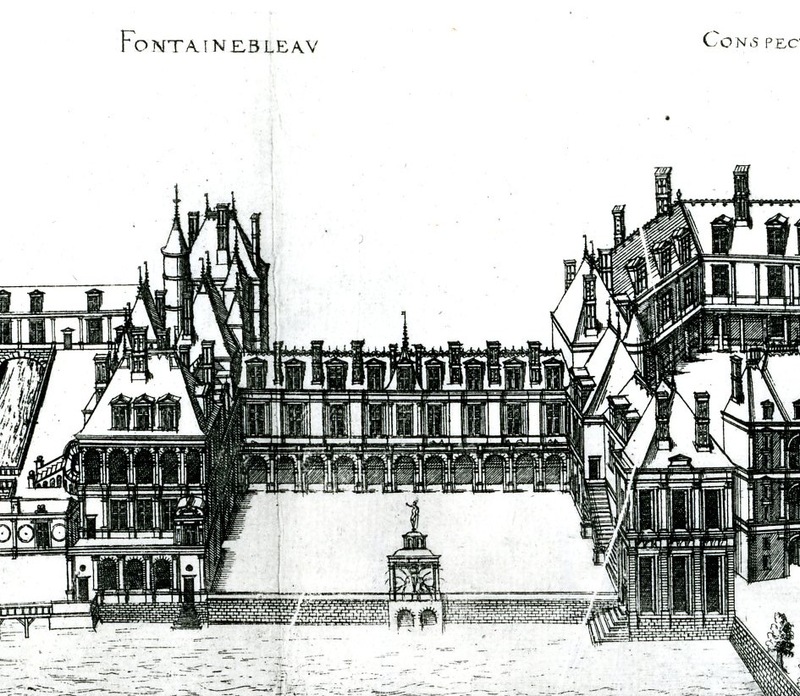 Du Cerceau’s view of the Cour de la Fontaine shows at the right the west end of the Gallery with its terrace (Fig.Du Cerceau Print, Cour de la Fontaine). 8 See Pressouyre, “Cadre architectural,” 1972, 16; and Bottineau, 1962, 24, n. 36. 9 The proportions of d’Orbay’s drawing are not precisely those of the actual gallery even when the raising of the ceiling is taken into consideration. Compared to the known height of the wood paneling in the gallery the height of the window sills in the drawing seems to be about 1.6 m. Pressouyre, “Cadre architectural,” 1972, 23, n. 40, pointed out that the woodwork of the casement windows was remade in 1639 and that involved some re-handling of the wood paneling, but apparently there is no indication in the documentary record of the change of the level of the sills. In the frescoed view in the gallery of the exterior of the south side of the gallery and in Du Cerceau’s comparable printed view the lower level of the windows is above the heads of the figures on the terrace. But it is possible that the level of the terrace was lower than that of the floor of the gallery (see Pressouyre, “Cadre architectural,” 1972, 23, n. 36, on Dan’s comment that the original terrace was of wood, which was repeated by Guilbert, 1721, I, 41. 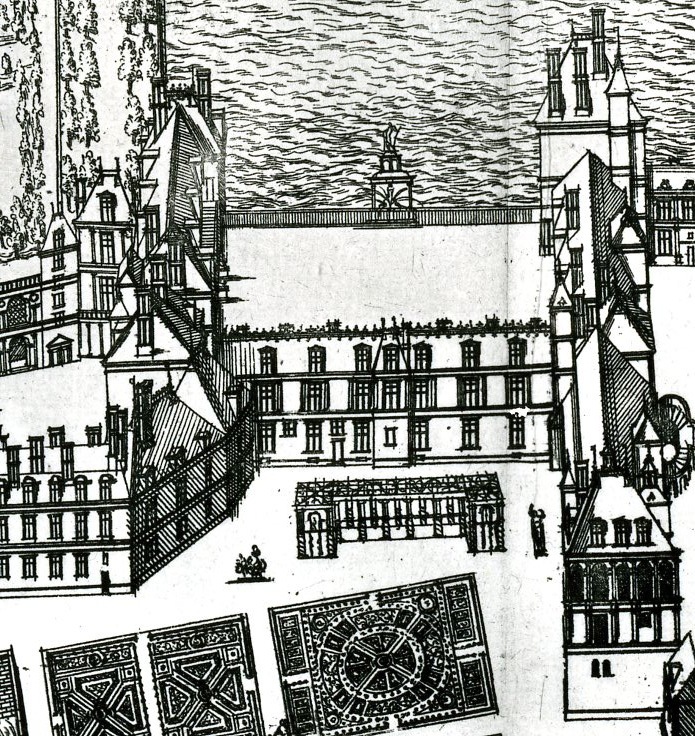 This could mean merely the floor of the terrace), for the proportions of the windows in all of Du Cerceau’s views, including his drawing in the British Museum and the printed view from the south, where the area beneath the windows is clear, indicate that their level was sufficiently low that the visitor could look out. It seems likely that the lower level of the terrace, which was used as a passageway around the gallery, was intended to keep those on it from looking into the gallery. 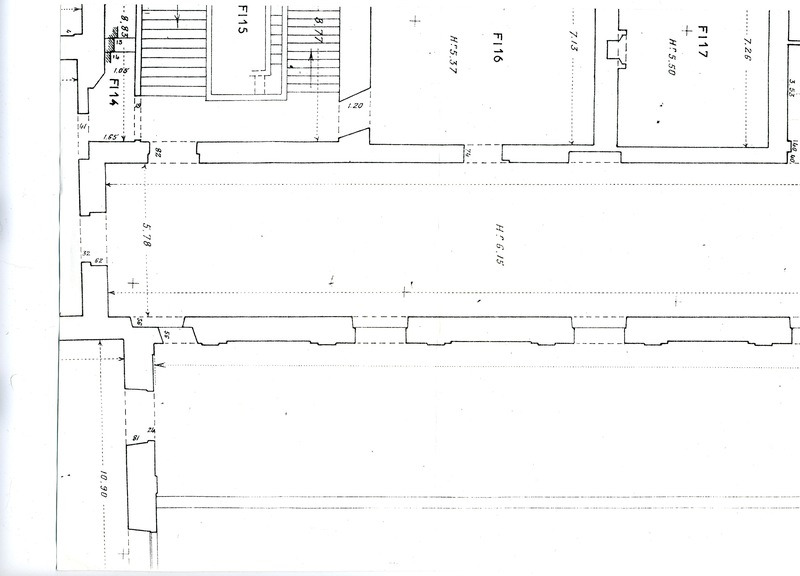 Du Cerceau’s plan shows entrances onto the terrace at its ends but no connections directly with the gallery. 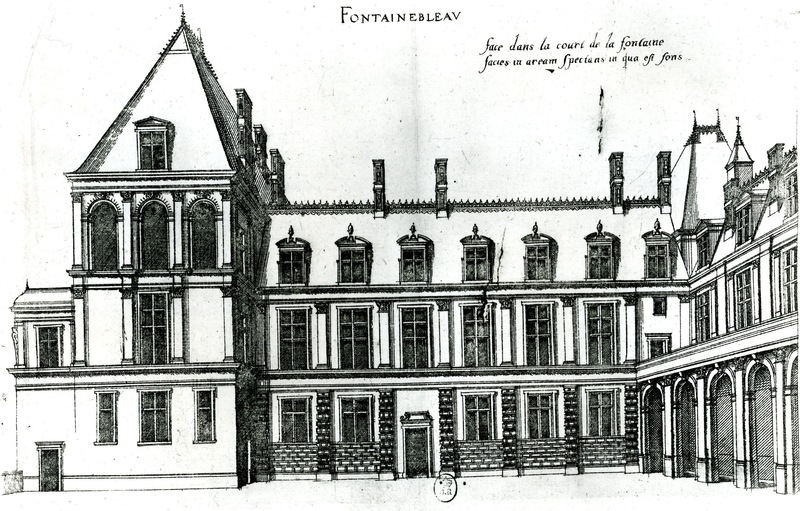 Percier’s drawing (Fig.Percier Gallery, full view) done in 1786 (Pressouyre, “Cadre architectural,” 1972, 13, and Lossky, “Contributions,” 1969, 127–128) shows the wood paneling at the windows on the south side up to the level of the other paneling in the gallery. McAllister Johnson, 1984, 140, n. 21, thought that this might indicate the original level of the windows above the heads of the visitors, apparently on both sides. But Lossky, 1970, 207–208, had already suggested that Percier’s drawing shows a theoretical reconstruction of the gallery, not its state when the drawing was made. It should be pointed out that the contract of 1539 (see below) for the woodwork of the gallery calls for the woodwork of the window embrasures which would not have existed had the paneling at the windows been as it appears in Percier’s drawing. 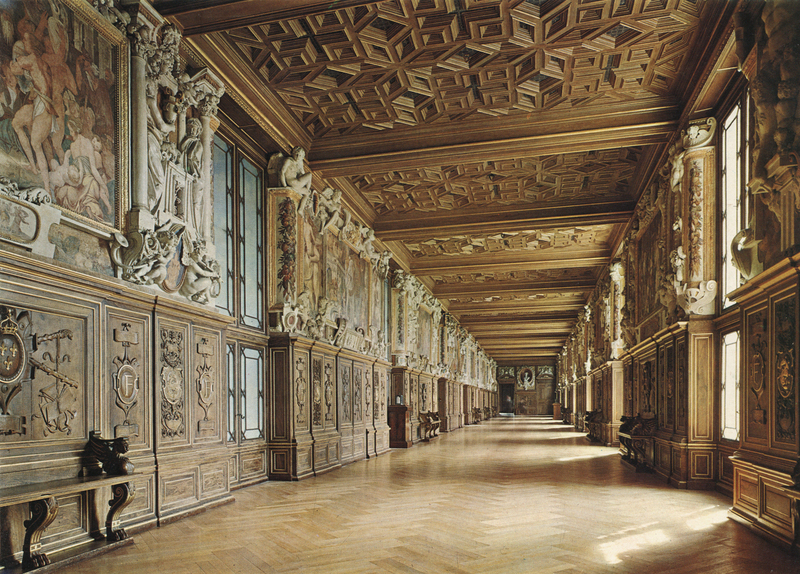 On the relationship of the gallery to the view from it, see Prinz and Kecks, 1985, 166–167, 425. 10 Pressouyre, “Cadre architectural,” 1972, 15, 22, n. 19, and Pressouyre, 1974, 30, and n. 21, believed that the present staircase at the west end of the gallery replaced the one specified in 1528, implying that the original smaller staircase was reached by a door in the west wall. 11 Pressouyre, “Cadre architectural,” 1972, 16, 19. 12 Herbet, 1937, 183, said, without giving any documentation, that the door was built before 1614, and this date was repeated by Barocchi, 1950, 115, n. 2, and by Béguin, 1972, 165. However, Pressouyre, “Cadre architectural,” 1972, 15, said that the door was opened in 1639. She cited a document (22, n. 16) pertaining to the making of the door panels themselves without, however, transcribing the document or giving its precise date. These door panels could have replaced an earlier pair. 13 See Pressouyre, “Cadre architectural,” 1972, 19, and “Restaurations,” 1972, 27–32. Lossky, 1974, 48, stated that due to the raising of the beams all the stuccoes between them and the wall must be of the nineteenth century. This was also suggested by Pressouyre, “Galerie,” RdA, 1972, 31. 14 McAllister Johnson, “Diplomatic Correspondence,” 1972, 53, gave the English Ambassador, Henry Wallop’s description of the gallery in 1540 as “sealed rownde aboute” which conveys the impression of an enclosed space and not a corridor (see below: LITERATURE).